Browse Lake Tahoe Campgrounds by Region and Rating! Easily one of the best campgrounds in Tahoe, Camp Richardson has more to offer than many of the surrounding resorts. Check out these two popular South Lake Tahoe campgrounds! Camp Richardson Campgrounds: This campground offers over 200 tent sites and is located just a few hundred yards from beautiful blue Lake Tahoe and close to Emerald Bay. Campers enjoy the Resort's full amenities including full-service marina with boat rentals, general store, sports center, lakeside restaurant and the ever popular ice-cream parlor. Pets NOT allowed. South Shore Lake Tahoe. Rent an Acker RV at a Lake Tahoe Campground and Save! Acker RV Rentals at Lake Tahoe offers you deluxe RV lodging accommodations at fixed campground locations in the greater Lake Tahoe area. We'll have everything set up and ready for your arrival. An Acker RV Rental is like having your own RV vacation home with Mother Nature just outside the front door. Perfect for families! 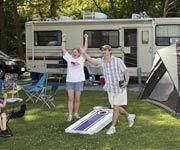 Check out our special deals, photos & floor plans, campground options and our very affordable rates. 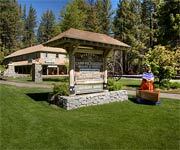 Relax in the wilderness at the Tahoe Valley Campground. Many of the regional and state parks around Lake Tahoe offer phenomenal Lake Tahoe camping facilities! 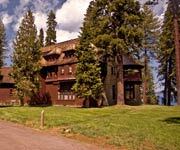 Lake Tahoe Regional Parks are a fantastic place to go camping, and offer many wonderful services and hiking trails. Be sure you check a few of these spots out before you get on the road, if you plan on camping in Lake Tahoe. Make sure you check out their fishing regulations and wildlife rules, so you don't get into too much trouble with the local rangers. This can definitely ruin a trip. Hiking in Lake Tahoe: Hiking and biking on trails is one of the most exciting things to do in Lake Tahoe. The Tahoe Basin is essentially a spiderweb of hiking trails. Check out our trails by region page for more detailed information about the most popular hikes around Tahoe. If you don't have time for a long, strenuous adventure, check out these popular short hikes. Also, take a look at our trail book maps for PDF topographical maps and more. Find all you need to know about Lake Tahoe, here on Tahoe's Best! If you plan on camping in Lake Tahoe, horseback riding is another fun activity for the entire family. Check out these popular horseback riding trails in the Lake Tahoe region and start planning your next Tahoe adventure today! Also, the Camp Richardson Corral has stables where you can conveniently reserve guided horseback tours while you are camping there. Camping is not for everyone and Acker RV Rentals allow that home-away-from-home comfort. Have Fun In The Sun And The Snow at Camp Richardson Historic Resort and Marina Campgrounds. Acker RV Rentals at Lake Tahoe Provides Lodging For Outdoorsy Folks. Sugar Pine Point State Park is a Camper's Dream! The U.S. Forest Service and the California State Parks operate several campgrounds around the Lake Tahoe Basin. For all day hikes and overnight stays, always remember minimum impact camping and PLEASE pack out what you pack in. For Tahoe camping reservations contact the  California State Parks (800) 444-7275. For Lake Tahoe camping permits, you can now get them online – go to www.recreation.gov and use their search box… enter “DESOLATION WILDERNESS PERMIT – Eldorado National Forest, CA” in the “Where?” box. For camping permits along the TRT or Tahoe Rim Trail, you must call the U.S. Forest Service Lake Tahoe Basin Management Unit Forest Supervisor's Office in South Lake Tahoe 14 days in advance. Their number is (530) 543-2600. For campfire permits in Lake Tahoe, visit our campfire permit page. Trail maps may be found in the hiking guide of Tahoe's Best. 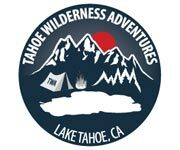 Extreme campers should check out our Wilderness & Area Information for the Lake Tahoe Region, found in the hiking guide of Tahoe's Best. The trail info you need to plan your trip may be found there. 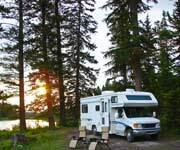 RV'ers will find a list of campgrounds suitable for your home on the road. All will enjoy our backcountry tips!